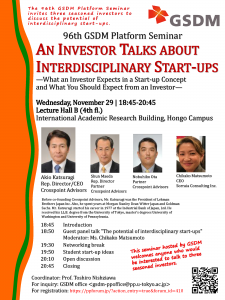 Ms. Chikako Matsumoto, CEO, Sorraia Consulting Inc.
： The 96th GSDM Platform Seminar invites three seasoned investors to discuss the potential of interdisciplinary start-ups. Before co-founding Crosspoint Advisors, Akio Katsuragi was the President of Lehman Brothers Japan Inc. Prior to Lehman Brothers, he was a Managing Director at Morgan Stanley Dean Witter Japan (1998-2001), where he served as the Head of Corporate Finance Department in the Investment Banking Division. He was also with Goldman Sachs (1993-1998), where he was responsible for covering Japanese financial institutions and corporations out of New York, and later returned to Tokyo to become the Head of Financial Institutions Group in Japan. Mr. Katsuragi started his career in 1977 at the Industrial Bank of Japan, Ltd. He received his LL.B. degree from the University of Tokyo, Master of Law from University of Washington, and Fellowship/Master degree from the Law School at University of Pennsylvania. Before co-founding Crosspoint Advisors, Shunichi Maeda was a Managing Director and the Vice Chairman of Global Banking at Deutsche Securities Inc. Prior to Deutsche Securities, he was a Deputy President and Executive Officer at Lehman Brothers Japan Inc. (2003-April 2008) Mr. Maeda began his career in 1969 at Mitsubishi Corporation, where he founded the firm’s Corporate Finance (M&A) team. He had also served on the World Bank (1984-1987) in Washington D.C. He is a graduate of the Faculty of Law at Keio University and holds an MBA with honors from Columbia University. 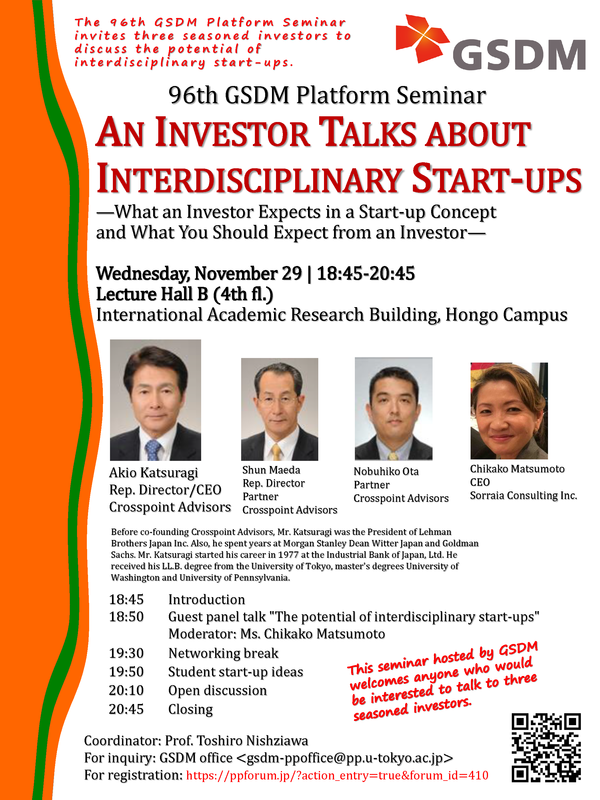 He is a member of Advisory Council of Columbia Business School Club of Japan. In addition to his career as a corporate financier and global business professional, he lectures at various universities in Japan and is an established commentator in the field. Before joining Crosspoint Advisors, Noby Ota was Executive Officer of Japanese mobile game developer KLab Inc. and CEO of KLab America (San Francisco) where he led the company’s business expansion in the Americas and EMEA. Prior to KLab, he was Director of cross border BD at ngmoco/DeNA (San Francisco) and was instrumental in the sourcing and execution of DeNA’s acquisition of ngmoco (DeNA West). Before his move to Silicon Valley, Mr. Ota was extensively involved in M&A, structured finance and investment banking in Tokyo and New York. Mr. Ota earned his BA in Law from Keio University in 1988 and started his career at Mitsubishi Bank (Bank of Tokyo-Mitsubishi UFJ). Chika Matsumoto is CEO of Sorraia Consulting, Inc. She provides strategic and financial consulting services to corporate and non-profit organizations seeking to raise their cross-border and international operations to the next level. Ms. Matsumoto formerly held a position of Senior Financial Officer at both the World Bank and the Inter-American Development Bank. She played a leading role in various international initiatives and innovative projects including natural disaster management finance, green finance, local currency finance, the Heavily Indebted Poor Countries Initiative (HIPCs), and the sovereign balance of payment crisis. Ms. Matsumoto holds advanced degrees in Public Policy and International Politics from both the Harvard Kennedy School and Hitotsubashi University. She is a Chartered Financial Analyst (CFA) and is fluent in Japanese, English and French.